Roaming Stamper: Color Challenge Friday! 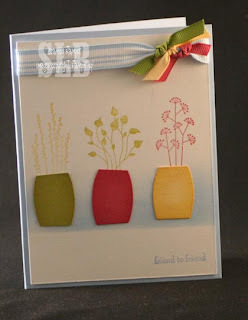 Today's Friday and it's my day to post the Color Challenge over at Stampin' Addicts. Despite the fact that Old Man Winter keeps trying to pull Ms. Spring back in, things are blooming around my yard. I wanted a card that reflected the wonders of Spring. I love this time of year when things start popping out of the ground and blooming. I got a card very similar to this in a swap at Leadership this year. Unfortunately, the artist didn't put any of her information on the card so I can't credit her. I loved the design and so I recreated it for today's challenge. All products from Stampin' Up! Love the card Sharon! What a happy colour combo and with my favourite set too! What a creative way to use this set! Love the flower pots.